One of the biggest parts of a divorce is how to split things up. From a tax perspective, we're looking at who gets what property, and how to split up financial assets. While, immediately, we're looking at changes in your tax returns for over next few years, we also have an opportunity to engage in tax planning around long-term assets such as real estate and retirement plans. Because we're going to be splitting up assets and transferring property between the two spouses, the first step is to figure out what's everything you own and owe. Based on that, we'll know what types of things we'll need to plan for. Gather documents related to real estate, and note who is on the title to each property. Consider hiring a forensic accountant, even if you are already working with a tax professional to prepare your tax returns. Forensic accountants are specialists in the type of accounting needed for courts and law enforcement. "In the forensic role, the CPA investigates and analyzes financial evidence and interviews parties to ensure all marital assets are included to prevent fraud," says Ray Knight and Lee Knight ("Tax Considerations When Dividing Property in Divorce," Journal of Accountancy). Remember to communicate honestly and openly with your accountant during your divorce. If you and your spouse already have an accountant who prepares your tax returns, your accountant will have a conflict of interest when it comes to providing both of you with advice. Just as each spouse hires his or her own attorney, having separate accountants frees the accountant from having any possible conflicts of interest in providing you with professional advice. If your accountant declines to work with you, don't take it personally. Instead, ask for a referral to another accountant. Also, bear in mind that accountants can only advise clients on financial and tax matters. Direct any legal questions to your attorney. The two main issues when addressing finances are property settlement and financial support. Let's discuss tax planning issues with property settlement first. General principle: "Generally, there is no recognized gain or loss on the transfer of property between spouses, or between former spouses if the transfer is because of a divorce," the IRS notes in Publication 504, Divorced or Separated Individuals. Rather, property transfers between spouses or former spouses are treated as gifts (Internal Revenue Code section 1041). Depending on your situation, "You may ... have to report the transaction on a gift tax return" (Publication 504). While you are not immediately taxed when the property is transferred between you and your spouse, whoever sells the property will incur taxes. Let's see how this general principle plays out for common types of assets. Primary residence: What we are looking for, from a tax perspective, are any unrealized gains or profit on the sale of the home. If and when the house is sold, the person selling the house may be able to exclude up to $250,000 in gains if the person has owned and lived in the house for at least two years in the five-year period leading up to the date of sale. This $250,000 exclusion is for each owner of the house. Any gains above that would be taxable. So the divorcing couple will want to look at the potential capital gains on the house. Suppose both spouses own the house, and the house has potential unrealized gains of $400,000, which is calculated by taking the house’s current appraisal value and subtracting it from the original purchase cost. If the house is transferred to one spouse and the other spouse is removed from the title, then the owner of the house will be sitting on $150,000 of potential taxable gains ($400,000 minus $250,000 exclusion for one owner). While having gains is a good thing, there is still the potential to exclude the full $400,000 of gains. How? One possible tax strategy is for both spouses to stay on the title after the divorce. This gets the divorcing couple an exclusion of $500,000, rather than $250,000 if only one person remained on the title. The divorcing couple would have zero potential taxable gains on a profit of $400,000 after the $500,000 exclusion. This strategy works because of an exception for divorcing spouses when meeting the use test for taking the exclusion. "You are considered to have used property as your main home during any period when: You owned it, and Your spouse or former spouse is allowed to live in it under a divorce or separation instrument and uses it as his or her main home," the IRS notes in Publication 523, Selling Your Home. Retirement plans: While there's no tax when transferring assets in a retirement plan, the tax will be due when funds are distributed from the retirement plan. 401(k), 403(b) and similar pension plans: The process for splitting up a 401(k) plan or similar pension account is what's known as a qualified domestic relations orders (QDROs). A QDRO is a "court order that assigns rights of an employee with a retirement plan to transfer some or all of the benefits to an alternate payee/spouse. It is sent to the plan administrator to divide the plan according to certain criteria," Carlisle says. How the 401(k) account is split is "spelled out in the QDRO." In Publication 575, Pension and Annuity Income, the IRS notes, "A spouse or former spouse who receives part of the benefits from a retirement plan under a QDRO reports the payments received as if he or she were a plan participant." The ex-spouse would even be able to roll-over his or her share of funds from the retirement plan to another retirement plan. For an in-depth discussion of qualified domestic relations orders, see "QDROs Demand the Attention of CPAs" by Ray Knight and Lee Knight (Journal of Accountancy, August 2014). Individual Retirement Accounts (IRAs): IRA accounts can be split between divorcing spouses, "essentially rolling assets in one spouse's IRA over to other person's IRA," Susan Carlisle says. In Publication 590, Individual Retirement Arrangements, the IRS states, "If an interest in a traditional IRA is transferred from your spouse or former spouse to you by a divorce or separate maintenance decree or a written document related to such a decree, the interest in the IRA, starting from the date of the transfer, is treated as your IRA. Securities: There's no tax on the transfer of stocks, bonds, mutual funds and other securities held outside of retirement plans. However, the tax will be due when the investments are sold. 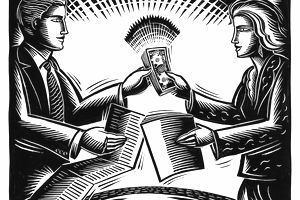 As a recordkeeping matter, "If property is transferred to you from your spouse (or former spouse, if the transfer is incident to your divorce), your basis is the same as your spouse's or former spouse's adjusted basis just before the transfer.... The transferor must give you the records necessary to determine the adjusted basis and holding period of the property as of the date of the transfer," advises the IRS in Publication 550, Investment Income and Expenses. The concept of trading assets: Sometimes, divorcing spouses will trade assets. For example, one spouse might transfer his or her portion of the house in exchange for a portion of the other spouse's retirement assets. Simply adding up all the assets and dividing them in half usually does not result in a fair division of property. Rather, the divorcing spouses will want to discount the value of the assets by the expected taxes due when the assets are sold. In other words, the analysis involves "comparing after-tax dollars for each asset being traded," Ms.
Carlisle says, "whenever it's reasonable and equitable to do so." In order to divide assets evenly, one spouse can provide cash to equalize the after-tax value of the property settlement. "An equalization payment is considered part of (the) property settlement and not taxable or deductible," Carlisle says. Child support is "never taxable, never deductible," Ms. Carlisle says. A payment to or for a spouse under a divorce or separation instrument is alimony if the spouses do not file a joint return with each other and all the following requirements are met. The instrument does not designate the payment as not alimony. The spouses are not members of the same household at the time the payments are made. This requirement applies only if the spouses are legally separated under a decree of divorce or separate maintenance. The payment is not treated as child support. "Family support packages child and spousal support [together] so that amount is fully taxable (and fully deductible to payor)," Carlisle says. She notes that family support is particularly attractive where one spouse is a high-income earner and the other spouse is a low-income earner in order to take advantage of the differences in tax rates between the divorcing spouses. However, Carlisle warns, the recipient "gets more money for accepting taxable support," in order to take taxes into account. This presents a planning opportunity. Couples may want to delay finalizing their divorce so that they are married at least ten years so that one spouse will qualify for the Social Security benefits. Upon qualifying for retirement or disability benefits, the divorced person "gets their own Social Security benefits or half of ex-spouse's benefits, whichever is higher," Carlisle notes, furthermore receiving benefits as a divorced person "doesn’t affect the other person's benefits," she adds. "Rule #1," Carlisle says, "Don’t invite IRS to the party." A person's filing status is determined on the last day of the year: December 31st. If a person is married on that day, they are considered married for the whole year, and they can choose between Married Filing Jointly or Married Filing Separately. That means, in the year the divorced is finalized, the divorced persons will be considered unmarried for the whole year if they have not re-married by December 31. Thus, in the year the divorce is finalized, divorced persons would utilize either the Single or Head of Household filing status. There's an exception to these general rules for Head of Household status. If a person is still married and "physically separated for more than 6 months in that calendar year with at least one supported child in the home" as a dependent, Carlisle notes, then that person could file as Head of Household. Be aware, that the period of living apart must include the last six months of the year. For the final married year, the couple could file jointly or file two separate returns. "Try to file Married Filing Jointly in the last year unless there are concerns about one's spouse's potential under-reported income or disagreement about allocating separate income," Carlisle says. There's another issue Carlisle detects as well. By filing separate returns, you'll need to divide up each person's income to report on separate returns. Especially in community property states, dividing up income can be very detail-oriented. "Rule #1: Don’t invite IRS to the party," Carlisle sagely warns. Dividing up each person's income introduces an extra layer of complexity, which makes the IRS do extra work to process the returns. Generally, whichever person has custody of a child for more than half the year will be eligible to claim the child as a dependent. That's because the residency test (one of four criteria to claim a qualifying child as a dependent) requires that the child reside in the same home for more than half the year as the person claiming the child. This is especially important if a person wants to be eligible for the Head of Household filing status, as that status also requires that a qualifying person (a closely related dependent) reside with the person for more than half the year. If the child resides exactly 50% of the time with each parent, neither parent will qualify to claim the dependent or for Head of Household. "The workaround," Carlisle says is for the child to reside with one parent "at least 51% of the time." The parent with whom a child resides for more than half the year may allow the other parent to claim the child as a dependent. This process is called releasing the dependent's exemption, and is accomplished by filling out Form 8332 and providing that to the other parent. This allows the noncustodial parent to claim the child's personal exemption. Generally, we would want to give the child's personal exemption to the parent with the higher income to generate a larger tax benefit than if the custodial parent claimed the child's exemption. However, Carlisle notes that the value of personal exemptions is phased out for higher-income earners. Further, the tax benefit of personal exemptions can be completely eliminated by the alternative minimum tax. This makes this particular move less attractive for higher-income earners. If you do agree to release the child's personal exemption, be sure to abide by your agreement. Carlisle's Rule #1 comes into play here as well: "Don't invite IRS to the party." If for some reason both parents decide to claim the same child as a dependent, the IRS will get involved to try to figure out which parent is truly eligible. You can avoid such IRS scrutiny by sticking to your agreed-upon arrangement for claiming dependents. Hopefully, these insights will help you plan your taxes when going through a divorce. Consult your tax professional to see how these techniques can be used in your particular situation. Susan Carlisle is a forensic certified public accountant specializing in family law and taxes in Los Angeles, California.